There are many different ways to meditate that have been proven to calm your anxiety, depression or other mind obstacles, and to ground you. Some people like guided ones, where a person is speaking for the entire time and tells them what to do or visualize. Others enjoy practicing in silence, and simply letting the mind journey and wander to wherever it needs to explore. 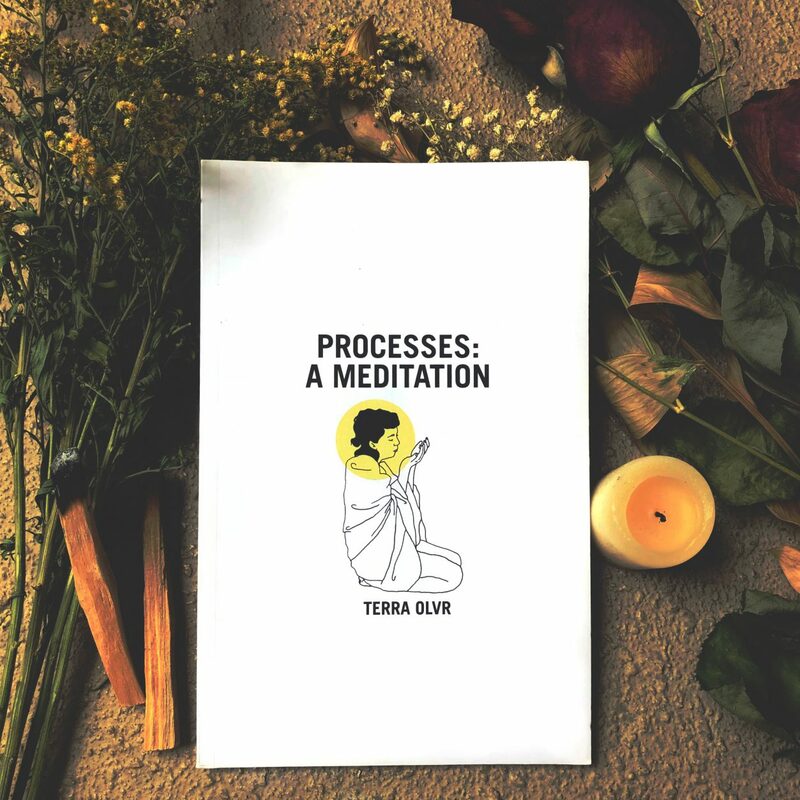 “Processes: A Meditation,” a zine by Terra Olvr (she/they) that I bought at their San Francisco Zine Fest table in 2018, is an inbetween option. For each set of pages, there’s one philosophical sentence on the right-hand page that seems to both acknowledge daily mistakes and struggles, and to encourage taking healthier choices of self-love. And on the left-hand page, there’s a drawing representing what it would look like in a meditative physical form or “how the verses live in the body,” said Olvr. While their verses allow space for the mind to roam, they’re also a starting point offering reassurance, and an intimate feeling that the author feels your feels – they get you, they’ve been there, you’re not alone in these dark times because you are with their healing spirit. 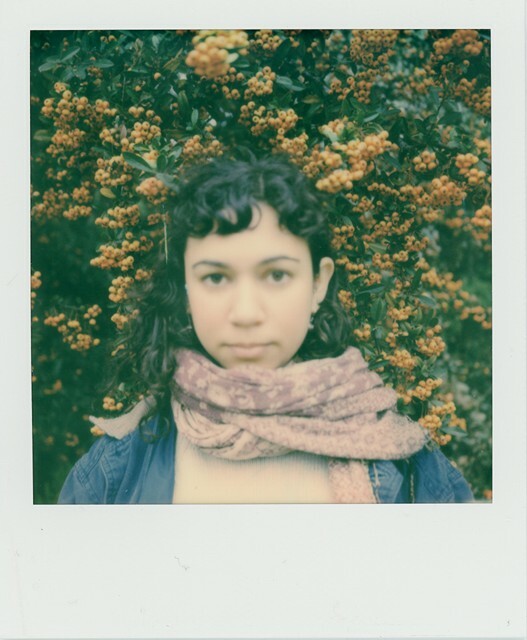 Terra Olvr is a writer, poet, and author (“And Still To Sleep,” “An Old Blue Light,” “Processes: A Meditation”), and the founding editor of Recenter Press. Throughout their life, Olvr has followed a spiritual path including studying in ashrams and monasteries, practicing nonviolent communication and Vipassana (a meditation technique emphasizing “to see things as they really are”), wandering naturally into new habitats in eco-communities, India, China, SF and now Philadelphia, and completing a pilgrimage. 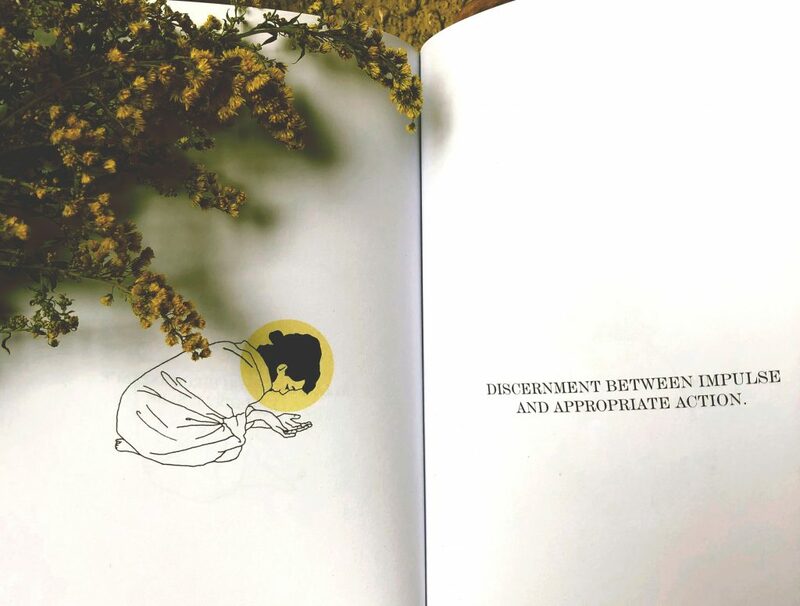 In their work they “explore unlearning toxic conditioning, mindfulness, working through experiences of trauma and exploitation, and collective liberation.” Below, Olvr talks about the deep meaning of their zine “Processes: A Meditation,” the impact their experience in China had in creating it, and how they hope it will support the healing of those who read it. Tell us about your zine. These illustrated verses are a witnessing of one’s self, in all that we have, in all that we’ve lost, in all that’s on its way to us. Processes: A Meditation unravels a small, unclouded window into a life in reflection of itself, as energy felt through the body, with the intent to bring ​the reader back to their awareness; their spiritual center. Why did you make this zine? I wrote Processes: A Meditation during an artist residency at The Schoolhouse of Mutianyu at the Great Wall of China in March of 2017. Each verse entered my awareness as I walked through Beijing, Mutianyu, and the Great Wall; they were some of the only pieces of clarity I could grasp onto while I was working through the overwhelming emotional and directional energy of a crisis. I think the verses of the book encapsulate some of the subtleties of my feelings, critically reflect on my decision-making process, and also serve as a motivator for the re-orientation of my life-path. The illustrations for the book were made nearly half a year later, after I moved to Philadelphia to rebuild my internal / external foundation, and are an attempt to show how the verses live in the body. How do you hope your zine will help others? In witnessing my own internal dialogue and emotional processing, and finding similarities or sameness in that, I hope that readers feel empowered to cultivate their own self-vigilance, to continue to untangle self-negation, and to develop deeper trust in themselves. Incorporating meditation into your self-care practice can be easy with Terra Olvr’s zine. If you’re able to purchase it, I hope you take it with you along your healing journey this year. Olvr’s way of living is inspirational in how much deliberate and clear effort they have put into surrendering to their spiritual calling. Discovering your own path can be overwhelming with all the spiritual books and classes available today, but reading just one line of their zine per day or per week might be just enough to nurture your mystical inner light and intuition. Purchase “Processes: A Meditation” below. Also, Recenter Press is accepting submissions for their first poetry journal! Details are below. Recenter Press would love to expand the ways that your voices are shared by releasing a poetry journal this spring! Please submit your poems / writing to recenterpressjournal@gmail.com by March 21st for publishing consideration in our first online issue. Each issue will also feature the work of one visual artist to accompany the selected poetry, so please send your work (photography, illustration, painting, sculpture, mixed media etc) our way. 🖤 What themes are we interested in sharing? ​• Self-reflection and personal transformation. ​​​• Meditation, mindfulness, revelation, spiritual discipline, religious reflections, prayer, and mystical experiences.​ • Mental health, chronic pain / illness, healing, survival, addiction, and recovery. ​​• Dealing with loss, mortality, trauma, exploitation, death, and grief.​ ​​​• Relationship dynamics, nonviolent communication, and unlearning toxic conditioning. ​​• Observations and analysis of material conditions and the struggle for peace and liberation. ​​• Anti-capitalism, anti-imperialism, political philosophy, revolutionary theory, and Marxism. More info at recenterpress.com/journal (link in bio). Looking forward to reading & sharing your work! The “Mini Q&A with Terra Olvr” was taken from our Mental Health Zine Library submission form. To submit your mental health zine, email us a PDF of it to strangeisbeauty@gmail.com.